Here is my engagement ring. 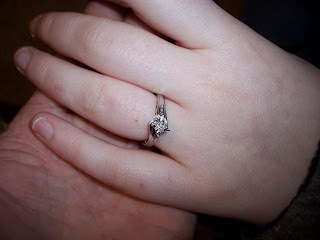 M proposed to me last month but we hadn't decided on a ring until now. I guess this makes it "official" and now the chapter of my life of "starting a new life" is over and now I am an "engaged woman." Everything has seemed to happen to fast I am caught in a whirlwind and it doesn't seem to slow down. I am so in love I don't think I could possibly love anyone as much as I could love M.